While the Nexus 4 and the Galaxy S III were signed by different makers (LG and Samsung, respectively), their designs have a lot more in common than a casual observer would think. Some sort of continuity was consciously sought and the Nexus 4 looks a lot like the Samsung Galaxy Nexus from the front. The hyperglazed plastic of the Galaxy and the Gorilla Glass 2 back of the Nexus 4 feel pretty similar to the touch, even though the Google phone has the upper hand in terms of durability. On the other hand getting the back panel of the Galaxy S III replaced is easy, whereas doing so on the Nexus 4 would be expensive and time-consuming. Opinions on looks are pretty subjective but we'll try to summarize the general feel of the two phones. The Galaxy S III comes in multiple color versions and the plastic either has a wood grain-like texture or is a solid color (the plastic used is not everyone's cup of tea). The curved shape makes it quite comfortable, but the Galaxy S III isn't the most exciting-looking phone in the world. The Nexus 4 on the other hand is a bit more angular and goes for the glass-and-steel look, which is quite popular. The dotted pattern on the back comes alive as you tilt the phone and we think it looks great, though if you want to be negative about it, you can say it's a little too flashy, with a disco-ball sort of gloss. 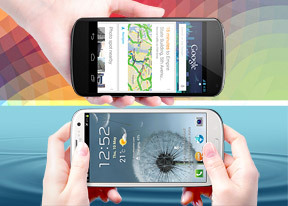 The Nexus 4 and the Samsung Galaxy S III are virtually the same height and width and practically the same weight too. The S III is a bit thinner, a feeling that's enhanced by its curvy lines. The front is where the two phones are vastly different in terms of specs. The Nexus 4 uses a 4.7" True HD IPS Plus screen by LG with WXGA resolution (768 x 1280) and 15:9 aspect ratio, while the Galaxy S III goes for a Samsung-made 4.8" Super AMOLED screen of 720p resolution and 16:9 aspect. The two displays have virtually the same size (the S III has an advantage of just under 1%) despite the difference in screen diagonal due to the different aspect ratios. Another thing to note is that both displays are protected by Gorilla Glass 2, which is curved. The curvature is more prominent on the Nexus 4, which is great as swipes starting from outside the screen are important to the handling of this one. The two phones take a different approach to hardware controls. The Samsung Galaxy S III goes for the company's traditional hardware and capacitive keys setup. The Nexus 4 follows Google design guidelines and uses on-screen keys instead. This is important both because they provide different controls (Menu / Home / Back for the S III and Back / Home / Task switcher for the Nexus 4) and because the on-screen keys make the effective aspect ratio of the Nexus 4 closer to 14:9, making for a squarer image and less real estate for most of the content. Another feature on the front is the notification light - both have RGB LEDs (so it can glow in any color you like). The light on the Nexus 4 is below the screen, where a hardware home key would normally be, while the one on the S III is in the top left corner. Everything else seems to be positioned pretty much the same. Both phones have a volume rocker on the left and a power/lock key on the right, a microUSB port on the bottom and a 3.5mm audio jack on top, two microphones (top and bottom), an 8MP camera with LED flash and loudspeaker at the back. The left side of the Nexus 4 does differ slightly - it has a microSIM card slot, which requires a SIM eject tool to open. There's no way to access the battery and no slot for a microSD card. The Galaxy S III has all those things under the removable back cover. From there you have access to the battery, microSIM card slot (which is blocked by the battery) and the microSD card slot (which is hot-swappable). Swapping SIM cards on the go is much easier on the S III as it doesn't require any special tools. The expandable memory is another clear advantage of the Galaxy smartphone. Both phones are powered by 2100mAh batteries and we'll have a look at the battery life in the pages to come. The Nexus 4 has Qi wireless charging enabled. The official Orb charger isn't out yet, but you can use any Qi-compatible charger. While the two phones are virtually the same size, their handling is slightly different. The Samsung Galaxy S III feels thinner (andt is actually thinner, but the rounded edges make the difference more tangible) and it feels lighter. The Google Nexus 4 feels a bit heavier and a bit thicker (due to its more angular sides). Still, that's just the perception of it, the pocketability of both phones is the same. The Nexus 4 allows a better grip and, overall, has a more pleasant, solid feel in hand. Winner: Samsung Galaxy S III. The Nexus 4 is sturdier, though replacing damaged back panel on the Galaxy S III is fast and cheap. The expandable storage, easy access to the microSIM card and swappable battery weigh in its favor too.